.. necessity as the mother of invention. What is best? Partos is the Dutch association for NGOs working in International Development. Its members work in the field of poverty reduction, humanitarian aid, human rights and sustainable development. Partos offers them a number of useful services and provides a platform for discussion about topics such as the future of international development. The development sector – at least in the Netherlands – is undergoing seismic change. The focus is shifting to the mitigation of mostly man-made disasters instead of human and economic development. All sorts of wicked problems start staring us in the face. Perhaps the ancient poets were right about the human race following a downward trail from a mythical golden age to the current iron age, during which humans live an existence of toil and misery and where “there will be no help against evil.” Well, it would seem Partos – its name suggests Hellenic ancestry, or was that Paris – still lives in the age of heroes and invites us all to share our best ideas on how we can collaborate better for innovation and beneficial change. You can find my contribution – in Dutch – by clicking here. The English translation is below. • Developmental evaluation (Patton, 2011), which is mostly about the application of the above in the field of evaluation. What options for collaboration? What we need are mostly application-oriented research- and learning programmes, both in the Netherlands and in the South. Let complexity thinking and systems thinking work their magic (although magic it isn’t, it’s much more like common sense). There is hardly a need for more theorizing. The amount of existing theory far exceeds anything a single human being – or even a sizeable group of people – can ever hope to absorb. Moreover, the existing theory seems to be adequate. The main problem is one of selection, diffusion, and learning how to apply. We should not get obsessed with ICT and big data. That’s simply ignoring the fact that any design (of a project, programme, policy, business) is an ultimate particular (ref. Harold Nelson, The Design Way). We are talking here about direct enhancement of effectiveness. What are the key themes? Systems thinking has developed generic approaches to address complexity wherever it occurs, irrespective of any domain or theme. The soft systems field evolved to address complexity in situations where humans play a key role. 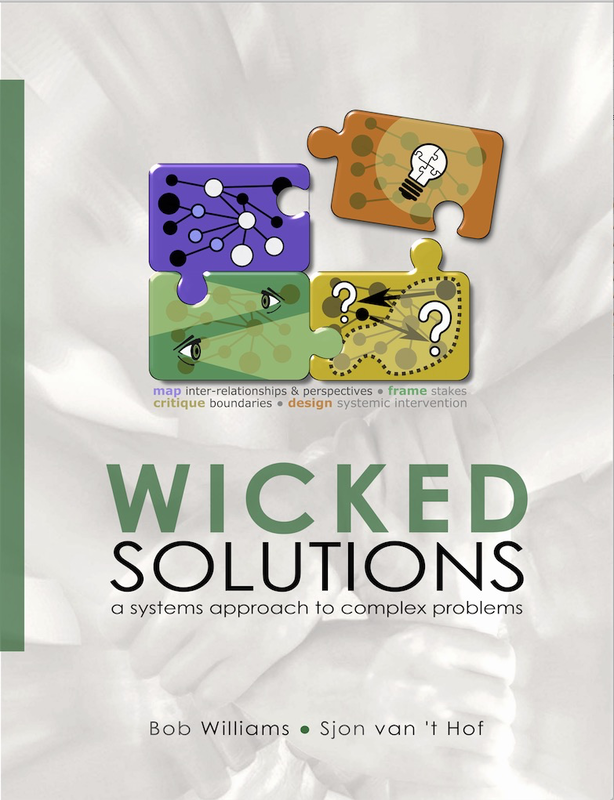 The systems approach was designed to address so-called wicked problems, i.e. problems that refuse to go away, no matter how hard we try. If we ignore these tools and methods, we do so at our peril. Systems thinking can and must be applied to all themes and subjects at all levels. This may sound like hocus-pocus or putting all one’s eggs in one basket, but we should not forget that systems thinking comes quite naturally to most humans (except “linear” managers, bureaucrats, and techno-believers). Churchman formulated it thus (a long time ago): ‘The public always knows more than any expert. The problem of the systems approach is to learn what “everybody” knows.’ As to themes: my personal preferences are: agricultural and rural development in combination with (social) entrepreneurship. What should Partos do? Partos ought to inform her members – and the public at large – about the conditions for effective innovation policy and promotion as described above. Probably Partos will need a bit of convincing or prodding (see P.S. below) before it can imagine itself doing so. Secondly, it should develop and support a network for people who are active in both the theory and practice of improving the performance of innovation. Thirdly, it should lobby wherever it can to muster support for more structured forms of innovation promotion in development co-operation. But most of all …. we should learn from the past, and in two ways mainly: (1) we should learn from our past failures and successes; and (2) we should learn about “old” systems methods that have been around for half a century or so. I am speaking here especially about the soft systems field that came into being after it was realized (in the early sixties) that some problems had characteristics that made them totally unsuitable to technocratic, bureaucratic, top-down approaches. People like Rittel, Churchman, Ackoff, Checkland, and Ulrich came up with solutions that until now have been mostly ignored by the development community. This is a good time to set that right. Titles of the other contributions: (1) versatility and future-proof by innovation; (2) collaboration and reciprocity; (3) collaborating for a ‘common goal’; (4) global connection; (5) together; (6) campaigns and knowledge sharing; (7) collaboration; (8) collaboration in equality for fighting common, global problems; (9) open & lean; (10) seeking each other out; (11) connecting innovator; and (12) digital. P.S. Last July I wrote a piece on “The innovative power of values in systemic evaluation” for that purpose. It explains in considerable detail how innovation by means of the systems approach or similar methods works. According to some it is a bit theoretical, but some other people that I consider to be highly knowledgeable like it a great deal.